What is the probability of reaching a milestone by the planned date? What is the probability of staying under budget? What is a conservative finish date for the project? What is a conservative final cost for the project? Which are the key uncertainties driving the project schedule and cost? How uncertain is the cash outlay over the project’s lifetime? What is the impact of a particular risk on the schedule or cost? How are the uncertainty of the project’s cost and delivery date related? Armed with this type of information, you can create a more realistic plan for your project, and control expectations about the time to delivery and cost. You can also investigate the biggest risks for the successful completion of your project and use that knowledge to produce a data-driven, effective risk management strategy. Tamara can be linked the Pelican risk management system’s risk database, or you can use Tamara’s internal risk register, or a combination of both. Tamara can be used for schedule networks of virtually any size and complexity. Tamara links to project schedules built with either Oracle Primavera (P3 or P6) or Microsoft Project. These original schedule models must be based on time-driven logic, not resource-driven. 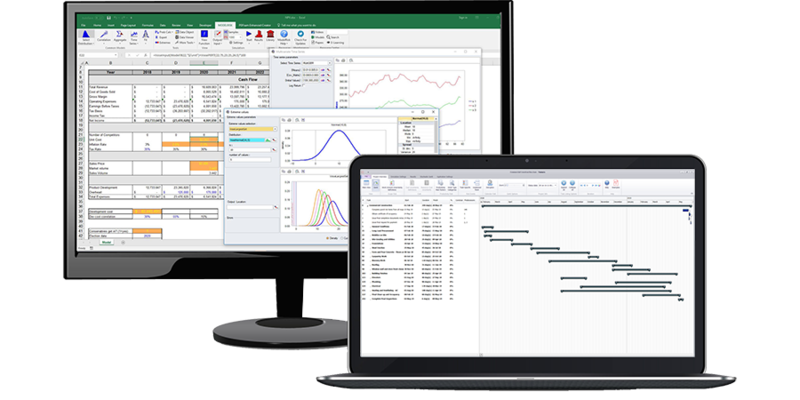 Tamara also provides outputs files that can connected to cost and more complex financial models built in Excel/ModelRisk. Tamara does not alter the original models built in Oracle Primavera or Microsoft Project. Instead, it creates a copy of these models to which it adds information about uncertainty and risk events. Create an appropriate project plan using MS Project or Primavera, using best guess estimates of task durations and cost elements. Try only to use Finish-Start logic if possible, as this is most compatible with uncertainty analysis. Ensure that tasks that only have a possibility of occurrence (e.g. rework) are included, even if their duration is set to zero. [Optional] Define and assign categories to similar types of task (like electrical installation). This is particularly useful for large plans as later it will facilitate building in correlation between durations. Open Tamara and import a copy of the original project schedule file. This will create a file that reproduces the schedule model and its logic. Assign quantitative ranges to the scope uncertainty definitions. [Optional] Define key types of activity for this project. Assign productivity risk factors for each key type of activity and the uncertainty of the impact for these drivers. Define the degree to which these drivers affect the different types of activity. Assign scope uncertainty for any tasks with significant scope uncertainty. [Optional, if cost risk is to be included] Assign cost uncertainty to any expense elements. [Optional] Build a risk register for the project within Tamara, or connect to an external database of risks, and link the risks to specific tasks it may affect. Save the model. Tamara will store all the uncertainty information provided. Run a Monte Carlo simulation of the model. Review the results. Tamara has no ‘Run simulation’ button. It automatically runs a simulation whenever you click the Results tab. Unless your project is very large, Tamara will complete the simulation almost instantly. Produce a report. Tamara allows you to build custom formats for your report, which are saved, and allow you to create reports in PDF format with a couple of clicks.